The sinking of parts of Mexico City into the former lake bed on which much of it is built is well documented, but to what extent does subsidence also affect other Mexican cities? Estell Chaussard and her co-authors considered this question in their article entitled “Magnitude and extent of land subsidence in central Mexico revealed by regional InSAR ALOS time-series survey.” Subsidence, often resulting from over-depletion of ground water, has a range of human impacts, including decreased supply of safe water, an increase in flood risk, and a greater hazard threat from building or street failure. 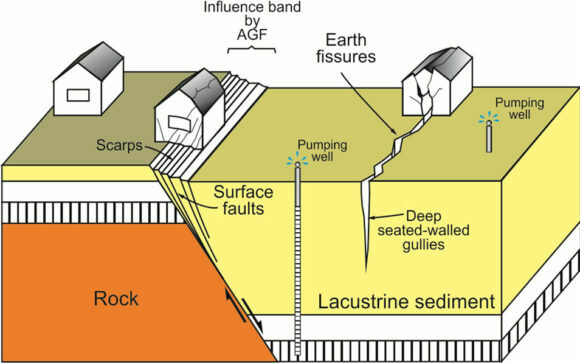 Ground failure by groundwater withdrawal subsidence. Credit: Natural Science, Vol. 6, No 3, 2014. An earlier study – Subsidence risk due to groundwater extraction in urban areas using fractal analysis of satellite images – had found that the intense groundwater pumping regime in Irapuato for urban supply and agriculture (the area is one of Mexico’s main strawberry-growing centers) had resulted in 18 subsidence fault systems with a total length of 27 km, causing damages to more than 200 houses. Meanwhile, previous work in nearby Celaya – Subsidence in Celaya, Guanajuato, Central Mexico: implications for groundwater extraction and the neotectonic regime – found that subsidence in that city was due to a complex combination of factors, and not entirely due to excessive groundwater extraction. Most earth fissures in the Celaya area were related to pre-existing structural features, and the authors suggested that thermal springs also appeared to play a role. Chaussard, Estelle; Amelung, Falk; Wdowinski, Shimon; Cabral-Cano, Enrique. 2013. 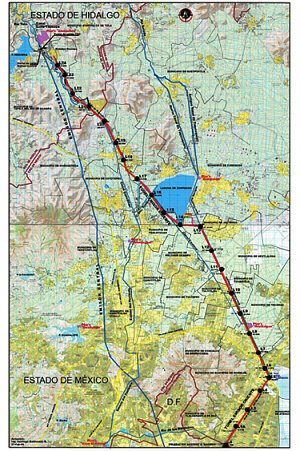 “Magnitude and extent of land subsidence in central Mexico revealed by regional InSAR ALOS time-series survey.” EGU General Assembly 2013, Vienna, Austria. Huizar-Alvarez, Rafael, et al. 2011. “Subsidence in Celaya, Guanajuato, Central Mexico: implications for groundwater extraction and the neotectonic regime.” Geofísica Internacional[online]. 2011, vol.50, n.3, pp. 255-270. Rodriguez, Ramiro, et al. Subsidence risk due to groundwater extraction in urban areas using fractal analysis of satellite images. Geofísica Internacional[online]. 2012, vol.51, n.2, pp. 157-167. Why are some parts of Mexico City sinking into the old lakebed? How fast is the ground sinking in Mexico City and what can be done about it? Was this fissure near Hermosillo caused by subsidence or by faulting? The illegal tapping of a Pemex oil pipeline in the northern state of Nuevo León caused an oil spill in August 2014 that contaminated a 6.5-kilometer-long stretch of the San Juan River. According to Víctor Cabrera, state delegate for the Federal Attorney for Environmental Protection (Profepa), about 23 kilometers of channels (mostly irrigation channels) have been affected in total. Profepa advised residents to avoid using water from the places affected and not to consume local fish. The illegal connection to the Madero-Cadereyta pipeline was first detected on 16 August 2014, and has been attributed to the criminal activities of organized crime. It allowed some 4000 barrels of crude oil to spill into the San Juan River. The spill affected the agricultural communities of Mexiquito, La Fragua, Soledad Herrera, Santa Isabel, Hacienda Dolores, La Concepción and San Juan, home to approximately 6000 people. The Nuevo León state governor Rodrigo Medina told reporters that an analysis carried out by water and drainage authorities and the National Water Commission (Conagua) had shown that the local aquifers had not been contaminated. 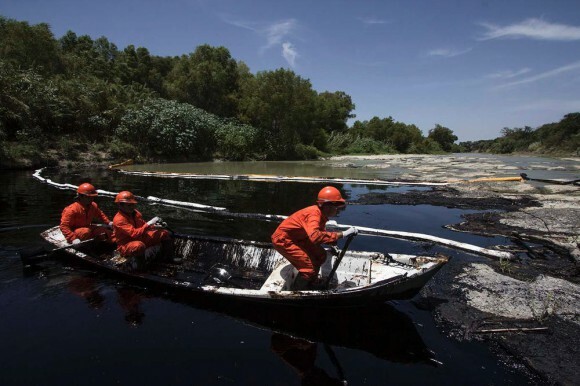 The oil spill did not reach El Cuchillo Dam, located some 70 kilometers downstream from the spill, which is one of three main reservoirs supplying potable water to the Monterrey metropolitan area. More than 500 workers from Pemex and other organizations have been employed to clean up the spill. Within two weeks, 90% of the oil spilled had been recovered and removed, according to a Pemex report. Officials expect the clean-up work on the river banks and in the irrigation ditches to take another two months to complete. Is the BP Deepwater Horizon accident the biggest Gulf of Mexico oil spill in history? 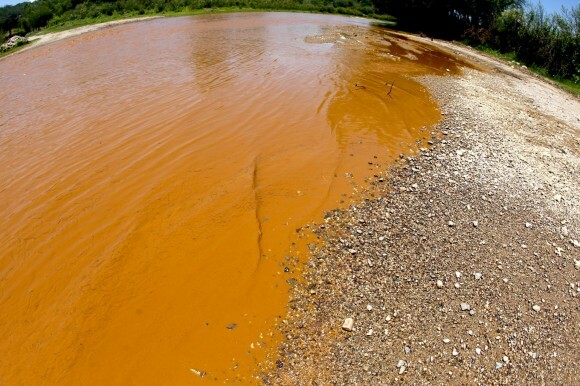 A toxic spill at a copper mine in the northwestern state of Sonora is the Mexican mining sector’s worst environmental disaster in recent history. The mine is owned by mining giant Grupo México, Mexico’s largest mining corporation and operated by its Buenavista del Cobre division. Grupo México is the third largest copper producer in the world and has a rail transport division, Ferrocarril Mexicano (Ferromex), that operates Mexico’s largest rail fleet. The Buenavista del Cobre mine, part-way through a $3.4 billion expansion plan, has some of the largest proven copper reserves in the world and is the world’s fourth largest copper mine. The spill allowed 40,000 cubic meters of toxic copper sulfate acid to enter the Tinajas stream in the town of Cananea on 6 August 2014. Buenavista del Cobre claimed the spill was the result of an unforeseeable heavy rain storm, which triggered a rise in the level of water and copper sulfate in a holding tank being constructed at the copper mine. Grupo México has formed a team of 20 experts from the University of Arizona and Mexican universities to investigate the spill. However, an initial report by the National Water Commission (Conagua) determined that the spill was caused by a flawed polyethylene pipe at one of the mine’s leachate tanks, together with a faulty valve at another tank. Conagua attributed the environmental disaster to negligence on the part of the company. Mexico’s federal environmental protection agency (Profepa) reported that the contaminants from the spill included copper, arsenic, aluminum, cadmium, chromium, iron, manganese and lead. Mexico’s Environment Secretary Juan José Guerra Abud called it the “worst natural disaster provoked by the mining industry in the modern history of Mexico,” and confirmed that the spill contaminated not only the 17.6-kilometer-long (11-mile-long) Tinajas stream, but also the River Bacanuchi (64 kilometers in length), the River Sonora (190 kilometers long) and the El Molinito reservoir which stores 15.4 million cubic meters of water. The contamination turned the waterways orange (see image) and affected the water supply of 24,000 people in seven communities along the rivers, forcing schools to close for several weeks while environmental authorities clean up the mess. More than 300 wells were shut down. The Sonora state government has been providing millions of liters of water via trucks to residents in the affected area. It has also started a temporary employment program to reactivate the local economy. The mining company has provided 13 million liters of water and $266,000 in immediate assistance to affected communities. Some 800 mine workers, members of Mexico’s national mining and metallurgical workers union, blockaded the mine entrances in protest at the company’s failure to prevent the spill. Workers have been fighting over contracts since a strike in 2007. The total clean-up costs are unknown, but likely to run into tens of millions of dollars. On 18 August, Profepa filed a criminal complaint against Buenavista del Cobre and another Grupo México unit, Minera México, for their alleged roles in the spill. Grupo México could be fined up to 3.3 million dollars if the complaint is upheld. Sonora State Governor Guillermo Padrés Elías has announced that the seven municipalities affected by the leached copper spill are filing a civil claim for damages. Eight years ago in the northern state of Coahuila, an explosion in a coal mine belonging to Grupo México left 65 miners trapped underground; only two bodies were ever recovered. A major earthquake struck southern Mexico at 7:27 local time on Friday 18 April 2014. The effects of the earthquake, which had its epicenter in Guerrero, were felt at least as far away as Mexico City. Authorities in the states affected, which include Guerrero, Morelos, México, Puebla, Oaxaca, Querétaro, Veracruz, Jalisco, Michoacán, Tlaxcala, Guanajuato, Hidalgo, Colima and the Federal District, have reported only minor damage, and no loss of life. The preliminary report from Mexico’s National Seismological Institute says that the earthquake had a magnitude of 7.0, with an epicenter 31 kilometers northwest of Tecpan in Guerrero, and occurred at 7:27 a.m. local time. The earthquake occurred at a depth of 10 kilometers. Initial reports from the U.S. Geological Survey (including a map) are that the earthquake was 7.5 magnitude, and at a depth of around 48 kilometers (30 miles). The USGS has since downgraded the magnitude to 7.2. First hand reports from Mexico City say that power went off in several areas in the north of the city, and that cell phone communications were also down in some areas. The Federal Electricity Commission reported 6 hours after the earthquake that power had been restored to 98% of the 1.2 million people affected in the Mexico City Metropolitan Area. Some windows have been shattered, and there are a handful of reports of minor structural damage, including 15 walls that collapsed and 48 buildings that suffered some damage. The city was quieter than normal because of the Easter holidays, during which many city dwellers take vacations at the beach. The most serious damage in Mexico City appears to have been in the Morelos residential complex in colonia Doctores, where the residents of two of the 14-story buildings have apparently been evacuated following reports of cracks in walls and passageways, and the separation of some stairways. Following a formal building inspection, one of the buildings will not be reoccupied prior to remedial work being carried out. Residents of Mexico City received 65 seconds warning via Mexico’s advanced Seismic Alert system (Sistema de Alerta Sísmica), which functioned precisely as it was designed to. There were more than twenty aftershocks in the five hours after the initial earthquake, the largest of which was magnitude 4.8. George Dunn in Puerto Vallarta (see comments) reports that buildings at the Bay View Grand were evacuated. “but all is well”. Many tourists in Puerto Vallarta and Acapulco left their hotel rooms temporarily during the quake which lasted about one minute. Later on Friday, officials of Guerrero state acknowledged that many public buildings in the state suffered damage from the earthquake. In Petatlán, near the epicenter, at least 100 homes were damaged. In the state capital of Chilpancingo, several walls collapsed, at least three homes and the tower of the Santa María de la Asunción cathedral suffered some damage. As a precaution, the main (tourist) dock in Zihuatanejo has been closed, pending a formal inspection, but is expected to be back in operation within the next day or two. Curious coincidence: The earthquake came exactly 108 years to the day after the Great San Francisco Earthquake of 1906. We will continue to update this post periodically over the next few days to reflect any significant changes. Hurricane Ernesto was the fifth Atlantic Ocean storm of this hurricane season. It struck the Quintana Roo coast on the night of August 7/8, as a Category 1 hurricane packing winds of up to 165 kph (103 mph), and then weakened to a Tropical Storm as it moved across the Yucatán Peninsula, along the Gulf coast of Campeche and Veracruz (August 8). It turned inland near Coatzacoalcos (Veracruz) with winds of 96 kph (60 mph), before continuing to weaken as it headed westwards over Oaxaca, across the Isthmus of Tehuantepec (August 9). 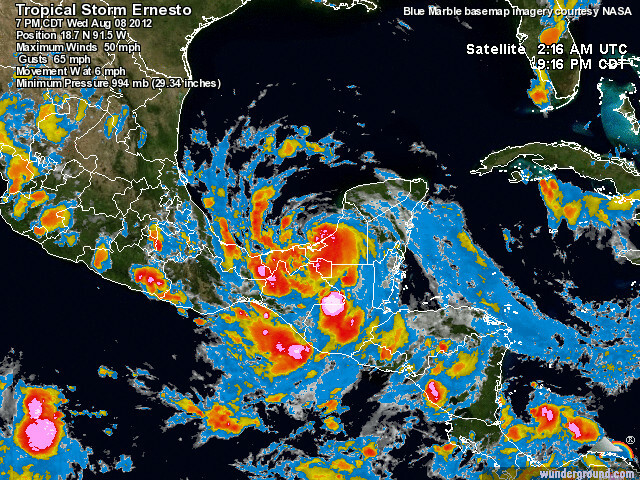 Ernesto brought violent winds and torrential rain to many parts of southern Mexico, impacting at least nine states: Quintana Roo, Yucatán, Campeche, Chiapas, Tabasco, Veracruz, Oaxaca, Puebla, Guerrero. Twelve deaths have been reported resulting from flooding, the collapse of trees and billboards, and lightning strikes. Federal authorities estimate that at least 19,000 homes were damaged by the storm. In Quintana Roo, prior to the arrival of Ernesto, authorities ordered the evacuation of tourists from resorts in Mahuahal and southern Quintana Roo to the city of Chetumal. Two cruise ships due to visit the Riviera Maya delayed their arrival. The villagers of Punta Allen were taken to emergency shelters as a precaution. On the Gulf coast, several major oil ports, including Coatzacoalcos, Cayos Arcas and Dos Bocas, were temporarily shut down. Throughout the region affected by Ernesto, power lines, trees, utility posts and advertising billboards were downed. Many areas were flooded, especially low-lying and “irregular” settlements, those lacking formal planning and infrastructure. Dozens of landslides occurred, and road crews had to clear mud, trees and debris that had temporarily cut many highways. The worst affected area seems to be Veracruz, which reported 9 deaths from the storm. A federal state of emergency has been declared in 58 municipalities in Veracruz, which allows authorities to access funds from the National Fund for Natural Disasters (Fonden) for the food, shelter and health needs of the population affected. These municipalities include: Álamo Temapache, Benito Juárez, Castillo de Teayo, Cazones de Herrera, Chicontepec, Chumatlán, Coahuitlán, Coatzintla, Coxquihui, Coyutla, Espinal, Filomeno Mata, Gutiérrez Zamora, Huayacocotla, Ilamatlán, Ixhuatlán de Madero, Mecatlán, Papantla, Platón Sánchez, Poza Rica, San Rafael, Tantoyuca, Tecolutla, Tempoal, Texcatepec, Tihuatlán, Tlachichilco, Tuxpan, Zacualpan, Zontecomatlán, Zozocolco de Hidalgo. It is likely to be some time before things get back to normal in these areas since more heavy rains are expected in the next few days. In which months are hurricanes most likely to strike Mexico? Not all volcanoes give any warning of impending activity. Exactly thirty years ago, just before midnight 28/29 March 1982, the El Chichón volcano in Chiapas erupted completely without warning and with unexpected fury. 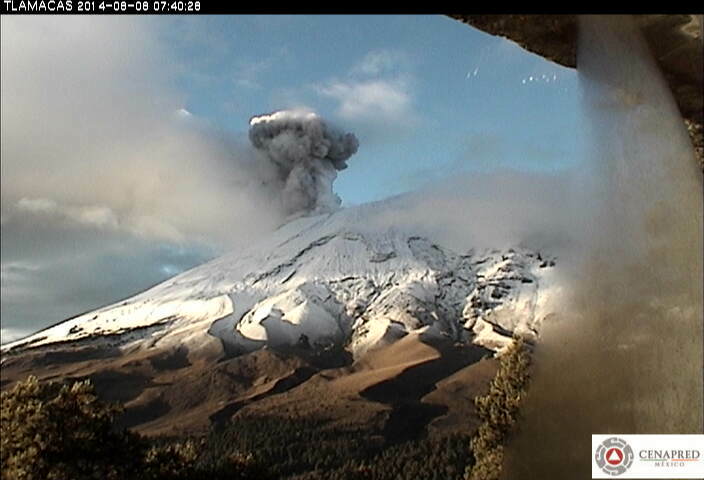 Two further eruptions followed in early April. The lack of warning caused heavy loss of life among local villagers who had been unable to evacuate their villages. About 2,000 people lost their lives as a result of the eruption. 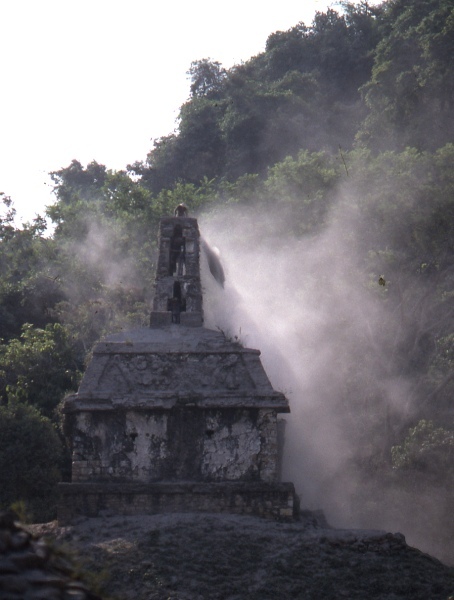 Palenque covered in ash following the eruption of El Chichón. Photo: Tony Burton; all rights reserved. Ash from El Chichón fell over a wide area of southern Mexico. 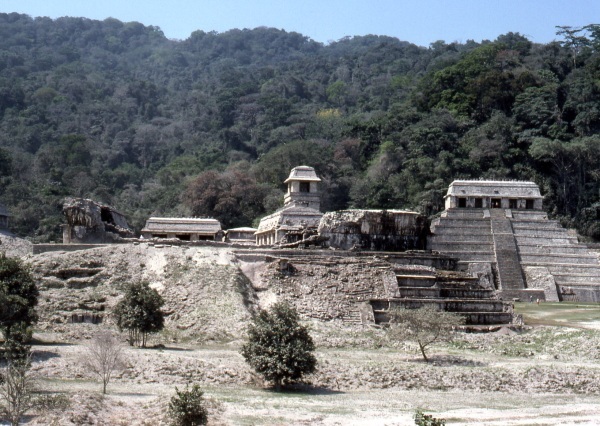 The nearby Mayan archaeological site of Palenque (set on the edge of what is normally a luxuriant, tropical-green jungle) was covered in ash (see photo above). Concerned about the potential for the ash to combine with rainfall and form an acidic solution that might erase delicate and intricately carved stones, workers at the site engaged in a major clean up, even before all the ash had stopped falling. The second photo (below) shows a worker on top of one of Palenque’s distinctive roof combs sweeping the recently-fallen ash off the structure. Sweeping ash off Palenque following the eruption of El Chichón. Photo: Tony Burton; all rights reserved. Vulcanologists later worked out that the last previous eruption of El Chichón had been 1200 years earlier. The eruption “left behind a brooding, sulfuric, acidic lake that formed when the dome collapsed into a crater and filled with water.” (Ref). Aztec glyph for a "hill that smokes"
El Chichón forced more than 7 million tons of sulfur dioxide and 20 million tons of particulate material into the stratosphere. The resultant cloud of volcanic gases circled the Earth in three weeks and was still dissipating three years later. It was expected that the additional particulates in the atmosphere would reduce the solar radiation reaching the earth and cause the following summer to be cooler than usual. However, in an unlikely coincidence, an El Niño event began that same year, negating any significant cooling effect from the volcano’s particulates. The El Chichón eruption was one of the largest volcanic eruptions of the 20th century, exceeded only by the 1991 Mt. Pinatubo eruption in the Philippines in terms of the amount of volcanic gases and particulates entering the stratosphere. Ash fell over a wide area, from Campeche to San Cristóbal de las Casas in Chiapas. By the time the eruption was over, the volcano, whose summit had been 1260 m (4134 ft) prior to the eruption, had lost 200 m in height. The Chiapanecan Volcanic Arc, which includes El Chichón, falls outside Mexico’s Volcanic Axis (the location of almost all Mexico’s volcanoes) and is thought to be related to the subduction of the edge of the Cocos Plate underneath the North American plate. 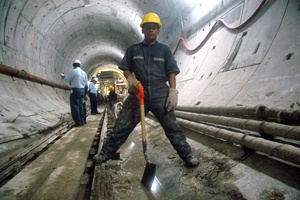 The Eastern Drainage Tunnel: a solution to Mexico City’s drainage problems? As we saw in an earlier post – Attempts to provide drainage for Mexico City date back to Aztec times – Mexico City has serious drainage problems. Because of the shifting subsoil as the land on which the city was built sinks an average of 10 cm/yr, the main drainage tunnels built years ago no longer have the slope (grade) they need to work efficiently. At least one of the feeder tunnels now slopes in the wrong direction! This has greatly increased the risk of catastrophic flooding occurring. After years of discussion, authorities decided a few years ago that the only viable solution was to construct another major drainage tunnel to take pressure off the existing system and increase the maximum drainage rates following heavy storms. The new tunnel, known as the Eastern Drainage Tunnel (Túnel Emisor Oriente), is said to be the world’s largest ever drainage tunnel and should be completed within the next couple of years. It is 7 m (23 ft) in internal diameter (wide enough for a tractor trailer) and can carry up to 150 cubic meters of water a second. The tunnel is 62 km (39 mi) long. It starts from the interceptor channel of Río de los Remedios and ends in a treatment plant in Atotonilco de Tula (Hidalgo), close to where the existing Central Drainage Tunnel flows into the El Salto River. Atotonilco receives 725 million cubic meters of water each year carrying 180,000 tons of garbage. Some of the treated water will be piped to the Mezquital Valley Irrigation District in Hidalgo where water usage exceeds natural replenishment rates. The remainder of the treated water will be given additional (tertiary) treatment before being piped into the overexploited underground aquifers to replenish them. 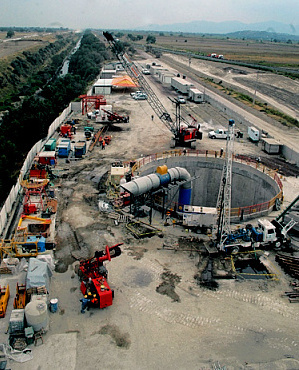 The Eastern Drainage Tunnel construction project is one of Mexico’s largest engineering undertakings ever. The total investment (45% government, 55% private) is almost a billion dollars. Six massive boring machines are working in coordination, each boring a 10km section of the tunnel. The work is challenging, partly because of the varied nature of the rocks (limestone, volcanic rock, sand and clay) and partly because parts of the tunnel are as much as 200m (equivalent to 40 stories) below the surface. Drug violence: is it safe to travel to Mexico? With so much media attention focused on drug violence in Mexico, many potential tourists and tour operators are canceling planned trips to Mexico. Are such decisions rational? The analysis below indicates that travel to Mexico is considerably safer than risking vehicle traffic in the USA. The US State Department has issued numerous travel advisories concerning visits to Mexico. As we discussed in a previous post —Which parts of Mexico are currently subject to US travel advisories?— the advisories focus on specific areas of Mexico. Unfortunately, many potential tourists overlook the geographic specificity and get the impression that all parts of Mexico are dangerous. Previous posts clearly indicate that levels of drug war violence vary enormously from place to place in Mexico. Is drug war violence concentrated in Mexico’s largest cities? Some areas of Mexico experience much more drug violence than others. For example drug violence deaths in Ciudad Juárez are 16 times greater than the Mexico national average. Consequently, the chance of an American visitor getting killed in drug violence in Ciudad Juárez is about 11,400 to one, still safer than risking traffic in the USA. The table shows the risks for a range of Mexican locations and compares them to the risks of US traffic. In the city of Puebla the risk is one in 6.6 million compared to one in 750,000 for Mexico City, one in 570,000 for Guadalajara, one in 360,000 for Cancún, about one in 300,000 for Chapala and Puerto Vallarta, and about one in 50,000 for Tijuana and Mazatlán. These results indicate that the chance of a visitor being killed by drug violence in Mexico is extremely unlikely, far less likely than the risk of being killed in a US traffic accident. For example, a visit to Chapala is 33 times safer than risking US traffic for a year, while Mexico City is 83 times safer. Though this analysis focuses on the travel of US tourists to Mexico, the results are equally relevant for visitors from other countries. The severe hailstorm which struck parts of central Mexico on 15 May 2010 lasted up to 30 minutes in some places. It was a particularly intense storm, with golf ball-sized hailstones up to 5 cm in diameter. The video below was uploaded to YouTube by iosergyout. (The commentary is in Spanish). ﻿The storm was caused by the southward movement of a strong cold front, which extended along the east coast of the USA and as far south as the Yucatán Peninsula. The cold front collided with hot air slowly circulating in an anticyclonic system that was stationary over central Mexico. The hot air was forced upwards, cooling to form heavy clouds, with moderate to heavy rainfall, and localized thunderstorms and hailstorms. 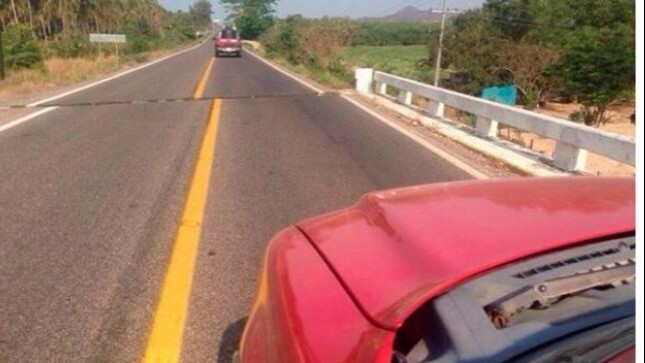 Despite the fact that Mexico’s National Meteorological Service had issued a weather forecast earlier that day correctly predicting the probability of severe hailstorms in much of central Mexico, damage from the hailstorms was considerable. In the state of Puebla, 6,600 ha were affected, centered on the town of San Martín Texmelucan. This area included 500 ha of cornfields which were severely damaged. In addition, about 40,000 fruit trees—mainly apple and peach orchards—were badly hit; some of the 200 growers affected claimed that up to 70% of their trees had been damaged. In Tlaxcala, more than 900 homes were damaged, as well as 1,500 vehicles and 400 ha of farmland. The worst-hit of the nine municipalities involved was Acuitlapilco, but costly damages were also reported from the municipalities of Totolac, Tlaxco, Panotla, Xaltocan, Hueyotlipan, Tecopilco, Atlangatepec and Muñoz de Domingo Arenas. Several emergency shelters were opened, though most of the people made homeless sought shelter with family or friends. Climatic hazards, including hurricanes and hailstorms are analyzed in chapters 4 and 7 of Geo-Mexico: the geography and dynamics of modern Mexico. Buy your copy today, so you have a handy reference guide available whenever you need it.